These carrots make an excellent side dish, especially because you can get them in the oven, then work on the rest of your meal. Preheat oven to 350 degrees. Cover a baking sheet with aluminum foil. Spray aluminum foil with olive oil nonstick spray. 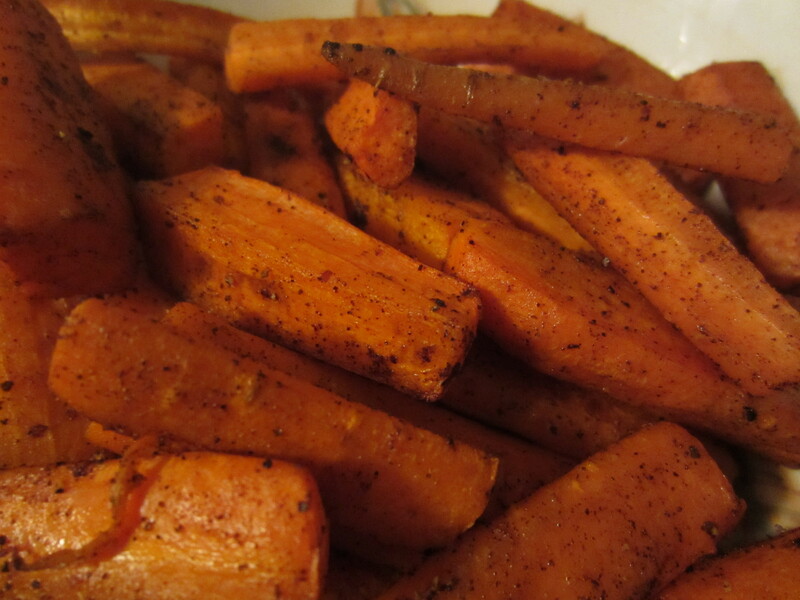 Place carrots on baking sheet and spray them as well. Season with salt, pepper, and chili powder. Stir around to evenly coat spices, then spread evenly on the baking sheet. Roast for 15 minutes. Stir around once more, then roast for another 15 minutes. Serve hot. As far as the seasoning goes, I didn’t want to say “1 tsp chili powder,” or anything like that, because really, this is one of those things where the taste is personal. Add as little or as much on as you like. 1tsp table salt = 2325.5mg. Yikes! 1tsp sea salt = 1600mg. Still yikes but much better. You know, I’ve been wondering for a long time why using sea salt is considered healthier for you. Now I guess I have my answer. Anyway, you can also add brown sugar for a sweet and spicy dish, but if you’re watching your carbs/calories, be careful. Honestly, since carrots are pretty sweet on their own, it’s not necessary. But I like vegetables so of course that’s my opinion. If you’re trying to get someone who doesn’t like vegetables to eat this, add the sugar. I realize I said this makes two servings, but keep in mind that each serving accounts for 2 ½ Veggie Servings (dietarily speaking). Personally, I can eat this whole batch without blinking an eye. And the best part is that I don’t have to feel guilty about stuffing my face with them! Carrots have many health benefits: they help guard you against the sun. They give you vitamin A, B, C, calcium, and potassium. They increase your red blood cell levels. They’re most known for their high beta-carotene content, which promotes healthy eyesight. Some people group carrots with starchy vegetables, but I don’t. That’s probably because Jenny Craig considers them a non-starchy vegetable. But I also recognize the vast health benefits they offer. So, if you think carrots count as vegetables, then remember that vegetables are considered “free” foods, and eat up! Make as many as you like!